Vail Christian coach Sheldon Kuhns and the Saints talk it over during their win over Hayden on Friday night in Edwards. OK, she isn’t a “Game of Thrones” character, but the Vail Christian junior carries a notable last name in the school’s history, and she lived up to it during the Saints girls’ basketball team’s 42-41 win over Hayden at the Wheeler Athletic Center in Edwards. She and senior Sarah Heredia led the charge as Vail Christian erased a 33-29 fourth-quarter deficit to move to 8-7 overall and 3-4 in the 2A Western Slope. Ellsworth and Heredia combined for 11 of the Saints’ 13 points during the fourth quarter for the comeback. 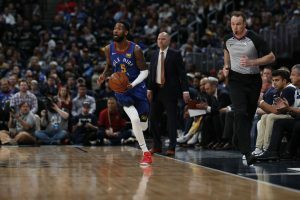 Ellsworth, who follows in the steps of Alexis, Austin, and Ethan aka Sug, Vail Christian alumni, and hoopsters, came off the bench and was huge for the Saints during the final period. She started the final eight minutes with a layup to halve the lead. Teammate Zoey Barela evened it at 33 with both ends of a 1-and-1. With 4:32 left, Ellsworth struck again in the paint for a 35-33 lead, Vail Christian’s first since the opening basket. Sarah Heredia gave the Saints the lead for good with a 3 with 3:52 remaining, and then came the play of the game. Heredia took the ball down the right side of the court and tethered a beauty of a pass to a wide-open Ellsworth for a 40-36 advantage. Heredia all but sealed it with a putback with 1:41 left in the game. Heredia ended up leading Vail Christian with 15 points. 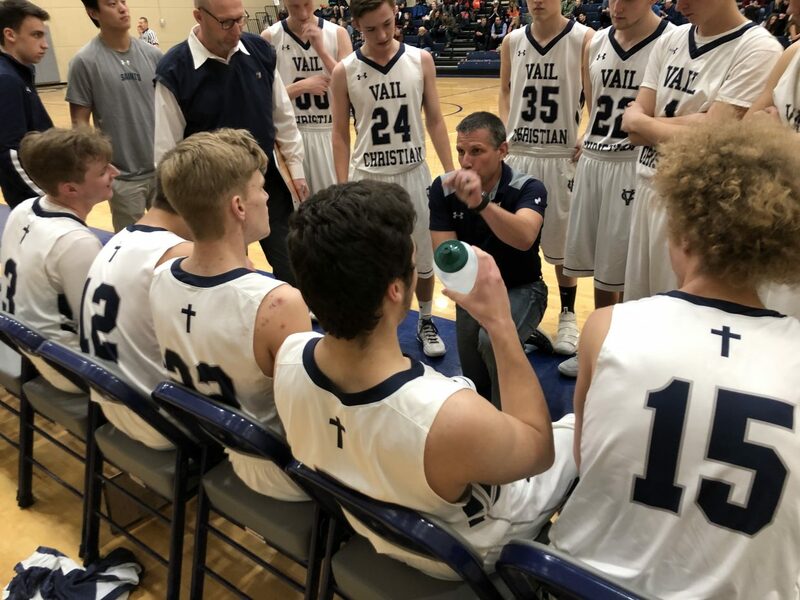 Vail Christian boys basketball won the Will Parker Nose Guard Rivalry game over Hayden, 66-43, on Friday night, making it a sweep of the Tigers. That no one except Saints coach Sheldon Kuhns gets the above reference is yet another sign of how far the program has come. Hayden, for years, was a measuring-stick game and a hurdle Vail Christian seemingly always found a way to lose to the Tigers from the program’s founding in 2000 until 2014. After a slow start — Hayden had a 4-0 lead — the Saints went on an 18-4 run, and were on their way to 10-5 overall and 7-1 in the 2A Slope. Kaleb Williams, Tommy O’Neil, Griffin McGuckin and Matthew Heiden all contributed valuable minutes, no small thing, given that Hayden was the second of three games this week. Alec Moritz and Zach McKeever led the team with 15 points each, while Jamison Lee ended with 10. Both Vail Christian teams are at Caprock Academy on Saturday.